The flavor and color of honey depends on the flowers and nectar from which it is made. Beekeepers who have access to large fields or groves of a particular crop may be pretty well assured that their honey is from orange blossoms or tupelo blossoms or clover blossoms, etc. We don’t have a good way to know the exact source for our honey so we call it wildflower honey but we definitely get different types of honey. 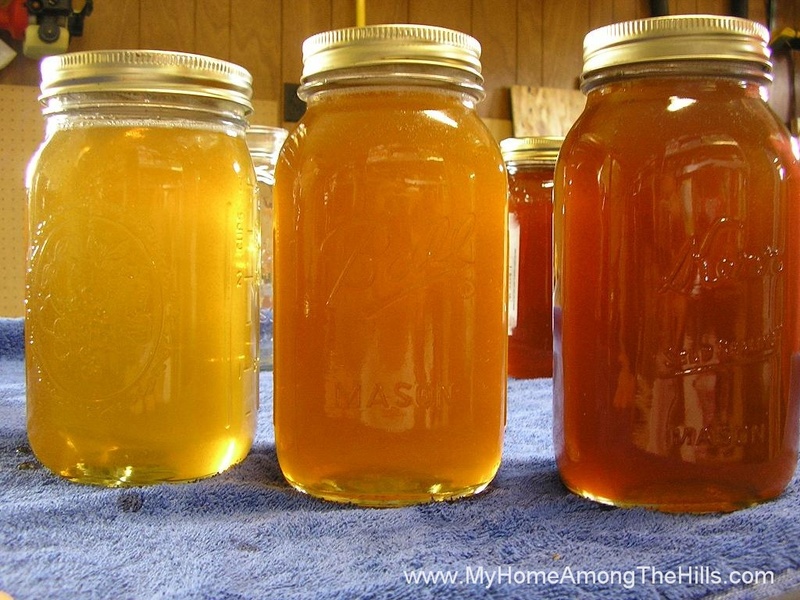 This year, we extracted three separate varities of honey. It is a bit of work to watch the honey in the frames to know when the variety changes. 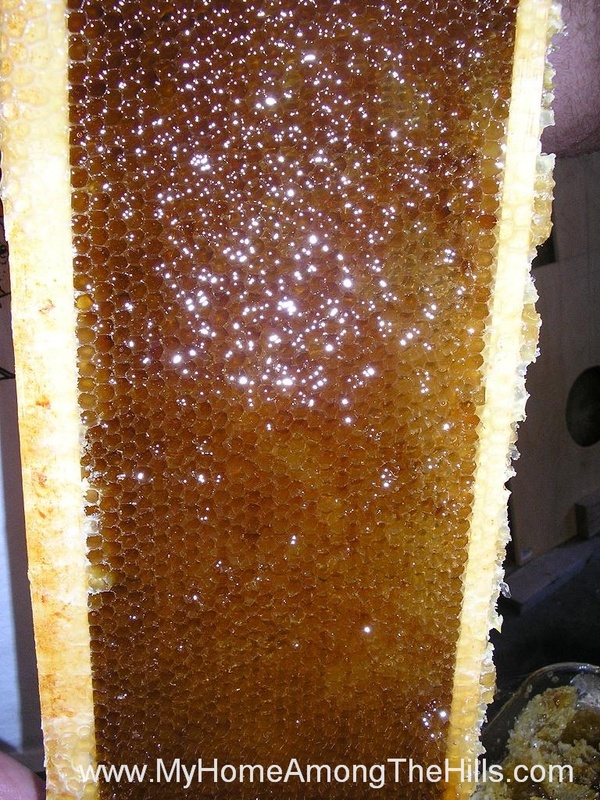 Honey in the frame is covered by wax which is opaque. 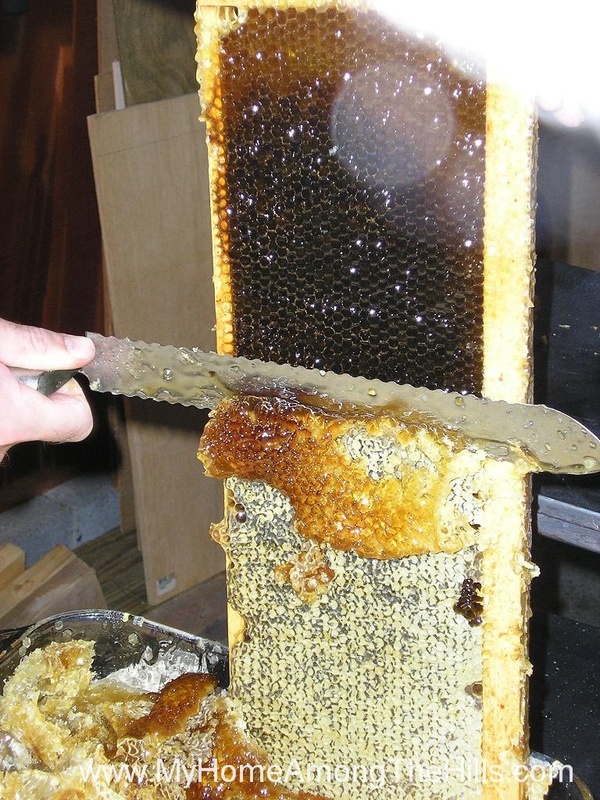 We can sort of see the color of the honey behind it but it is fairly subjective. Individual frames are often of the same variety though not always. Bees just store the nectar that is available at a given time and don’t care a single bit whether we can easily separate the different types of honey. They are funny that way. Those honey look delicious and I know they are! Do you sell the honey or they are only for your consumption? BTW, I posted a picture of my sunflowers at my blog. I saw it on your site…awesome! I hope you get some feedback on saving seeds! I do sell a bunch of the honey. We use a good bit but no where near all that we harvest. Last year we harvested around 400 pounds. The harvest was a lot less this year but still more than we can eat. Love your posts about honey, I want to learn more about the whole process and maybe get into it down the road. Thanks Kim. It’s pretty easy to get in to. We eased in to it money-wise. To get started, most folks start with 2 hives (for comparison to each other…hopefully to notice when one is different), a bee suit and a smoker. Like most things, you can spend as little or as much as you want. We made our extractor when we first started. I worked in long pants and shirt before I got a suit. I built my own boxes (though that’s not always cheaper). Anyhow, it’s easy and generally only a lot of work at harvest time. The bees are not aggressive and won’t attack you just hanging out in your yard. Holler if you want more info! Gorgeous! I loooove honey, and a couple of hives are on my wish list. Pretty cool to read about how (relatively) easy it is! Thanks Meg! It’s definitely easy to keep bees…just hot and heavy and sometimes painful if a bee gets attitude!